It’s been almost 17 years since I last skied Whitewater. Not that I avoided it; for whatever reason my winter travels have taken me elsewhere. But it was time to return. And this is photographer Steve’s home turf. On any given day, when conditions are on, you might run into Steve, Kari Medig, Mitchell Scott, Dave Heath, Nick Waggoner or any number of other media types associated with skiing in Canada, looking for partners for a slackcountry lap on Five Mile, White Queen, Scob’s or elsewhere. After riding the Silver King chair, we skin up next to the sign that informs us that we are leaving the ski area boundary. We puff our way up a well-travelled route, and in 10 minutes gain the ridge, then follow a cat track briefly until it peters out and the ridge steepens toward Half Dome, which with Ymir Peak cradles blissful Ymir Bowl. It’s snowing with increasing intensity and wind gusts, the sort of weather that quickly builds stiff, dangerous storm slabs. We skin upward using snow scoops around krumholtz trees as convenient places to switchback. Soon it gets awkward. So we opt to strap skis to packs and bootpack. Last time I was here it was the year 2000; the skies above Whitewater were clear blue. I was with another good friend, Ned. 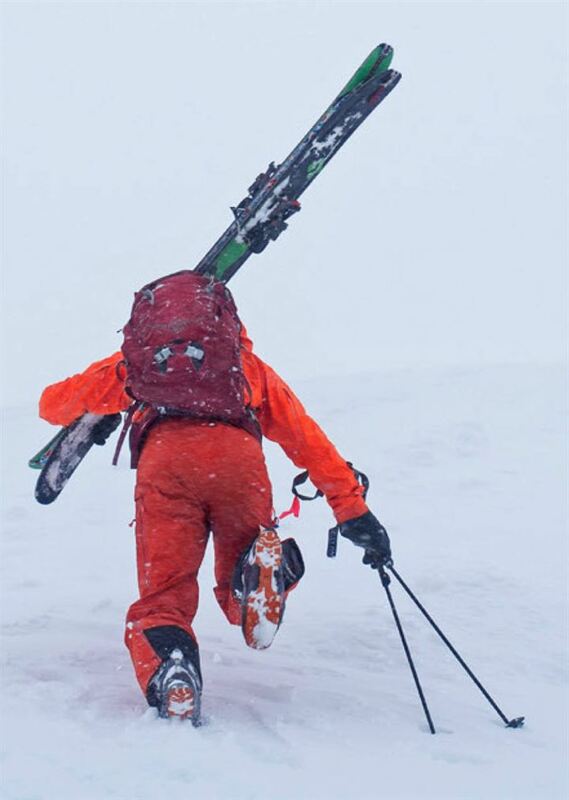 The weather was favourable for ski touring, the snow conditions—not so much. A hard wind slab had formed above a persistent surface hoar layer, buried 30 to 40 cm down. We knew there was risk but we opted to go for a walk and head for Scob’s Knob. I rationalized the decision, telling myself that we could link islands of trees and ski in relative safety. We cut into Ymir Bowl beneath Half Dome, then skied the open low-angled terrain to a treed bench. From there it gets steep. The snow was hard. Our skis barely left a mark when we turned. Ned went first and I watched as he carved over the slightly convex roll near the top and onto the steep planar face. In less than a minute he stopped in a copse of trees, looked up-slope and waved his pole in the air, as if to summon me. I launched down the same line. Two turns in, the slope suddenly buckled beneath me. Ned would tell me weeks later that I still had a smile on my face as the avalanche gathered power and momentum, carrying me downward and through the trees. When I tumbled to a stop, I was on the surface, but my body was broken. It felt as though red-hot irons were being held to my legs. I raised my head meekly and looked in horror at my lower legs splayed out in such gruesome, unnatural angles that they seemed to belong to someone else. Now I’m back with Steve, a decade and a half later, peering down the same feature that nearly killed me. The physical scars healed a long time ago, so too have the emotional ones. “How do you feel?” Steve asks, knowing what I’m thinking. “Kind of gripped, to be honest,” I reply. Steve nods. Neither of us feels comfortable skiing this line today, with the building storm-snow and wind. We traverse skier’s left to a more moderate, treed feature. I let Steve go first and he shreds it in one go top-to-bottom, until he’s safely way out in the flats. I’m alone in Ymir Bowl now, feeling hesitant. My heart races as I point my tips down next to Ogle’s tracks. The snow is wonderfully light. I don’t stop, big fast turns, blood pumping as though I’m trying to hover above the snow. I soon rejoin Steve. We say nothing, just tap our poles together, then follow the bumpy track back to the ski area boundary. I remember lying in the ambulance that would cart me off to Kootenay Boundary Regional Hospital in Trail, euphoria sweeping through me with the first surge of morphine. I was going to be all right. This time, Steve and I settle into chairs in Coal Oil Johnny’s Pub and clink together mugs of Faceplant Winter Ale with a similar feeling of euphoria. Dragon slain.